Most of us do not like change and the healthcare industry is no different. Yet, the healthcare sector is one which is set for dramatic and disruptive change, whether this change is welcomed or not. The challenge is straightforward - governments must find ways of providing higher quality care for their growing, ageing populations at lower cost. For healthcare organisations, this also means that living in the status quo is no longer an option. The keys to change are strong leadership and a willingness to try new ideas. These can help change the way healthcare organisations work. Leaders need to respond imaginatively, incentivising providers to focus on quality, involving patients more regularly in how their care is designed and allowing clinicians the space to innovate. It may sound obvious but defying logic, healthcare providers are rewarded for the volume of care they provide and the number of procedures undertaken, not quality. The standing assumption is also often that the doctor always knows best - which is not always the case. Overturning these long held beliefs are important if much needed change in the sector is to take place. Strong leadership is needed to pave the way for changes. In a recent KPMG healthcare report entitled Something to teach, Something to learn: Global perspectives on healthcare, we spoke to 40 of the world's leading healthcare organisations. The one key question on our minds was: Can courageous leadership bring about transformation in the healthcare sector? In a sense, institutions and governments who are bearing the cost of healthcare, the payers, need to become activists at the same time. Many are beginning to realise that providing better value often means ensuring that care is consistently high in quality, lower in cost, appropriate and timely. In other words, institutions paying for healthcare need to use their influence to help redesign care delivery systems, many which have been with us for decades. This will require both public and private payers to develop a very different approach to their operations. They will have to become, in the words of one private insurer, truly activist. Activist payers are becoming the agents of change. They are forcing healthcare providers to contract for services differently, and become more focused on the outcomes. To quote Pieter Hasekamp, the chief executive of the Health Insurers Association in the Netherlands: "We're learning that a partnership - with sharp edges where necessary - is the best model. Just 'tough negotiating', seeing each other as adversaries, will not work, that's clear." A Netherlands health insurer did just that, leveraging insight supported by healthcare data to renegotiate care contracts. Primary care centres were set up alongside general practitioners and hospitals with impressive results: one hospital cut its costs by 50 per cent in only two years. 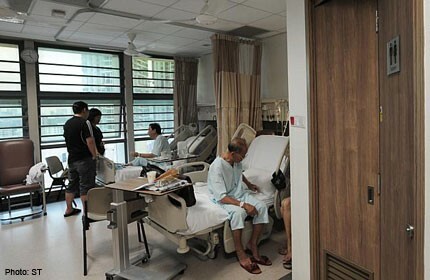 In Singapore, the Ministry of Health led the drive towards greater transparency by publishing data on the average hospitalisation bills of all its public hospitals for the top 70 medical conditions on its website. By 2011, data from private hospitals in Singapore were also made available. Since the initiative started, it has driven hospitals with the highest costs for treating certain medical conditions or procedures to review their processes and even their choice of laboratory tests and treatments. This is to ensure that prescribed treatments are indeed cost-effective based on current evidence. Besides costs, hospitals are also increasingly held accountable for the effectiveness of their other operations. These include waiting time in emergency departments, infection rates, re-admission rates and even customer satisfaction scores. The common reason underlying this progress was in no small part due to strong leadership. Giving patients a greater say in their treatments is transforming outcomes and costs too. In rapid growth economies such as India, providers who regularly engage their patients are showing greater success than those operating in the traditional doctor-centred style. One insurer's preventative mobile health programme will improve health outcomes for one million people by the end of this year. Good leadership often means looking beyond short-term goals to long-term ambitions. The best leaders, while not shying away from the biggest challenges, will reduce complexity. They will look beyond process targets, allowing space for their organisations and staff to innovate and experiment in the pursuit of new and better models of care. We see examples of this happening in some of our public hospitals in Singapore. Examples include Tan Tock Seng Hospital's Kaizen Project Office and innovation hubs or centres in Khoo Teck Puat Hospital or Changi General Hospital. Evidence suggests that many leaders, despite their assurances, are not really ready for the drastic transformation that is heading their way. Research shows that many of our interviewees expected "moderate or major business model change" within the next five years. While many supported new partnerships among patients, providers and payers, they nevertheless resisted the idea that these changes would affect their own individual organisations. Research among US healthcare leaders shows that 95 per cent expect healthcare systems to be disrupted within the next five years, with almost two-thirds predicting "major change". Yet, at the same time, 75 per cent of those same respondents maintained that their own current business models are sustainable or "somewhat sustainable". In Singapore, what our healthcare leaders need to manage is the transformation that will come with integration of care and the development of regional health systems (RHS), which are new networks of care within specific local geographic zones. Within each RHS, partnerships among GPs (general practitioners), community hospitals, nursing homes and other stakeholders will be forged to ensure integrated care for patients within their respective regions. In a speech made earlier this year, the Singapore Health Minister noted that "strong and lasting RHS partnerships will take time to build". He added that trust and understanding among providers from various sectors - public, private and the community - are critical for strong partnerships to enable the delivery of coordinated, holistic care to patients. Therefore, new skills and capabilities such as collaboration, trust-building and the willingness to work across institutional borders and professional silos will be valued. Clearly, healthcare leaders must step up. New business models will mean new partnerships between patients, providers and payers, and new ways to work together in a coordinated fashion. Often, taking the first step on a journey down this unchartered path will represent an act of courage, faith and both highly visible and committed leadership.